Do you Design by Eye or Calculation? Every month I look forward to the day when my Fine Woodworking magazine comes in the mail. 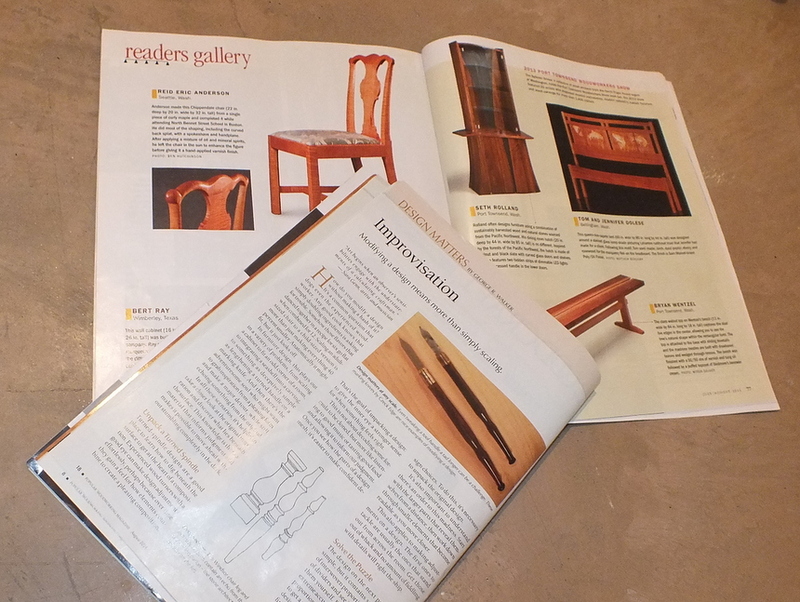 The first thing I do is turn to the reader gallery to see what other woodworkers are building in their shops. I find their designs awe inspiring. Their choices in contrast in color of the different woods used, the selecting of the boards to show off the best grain, and all the way down to the overall shape of the piece. Those few pages are the main reason why I subscribe to the magazine. After I spend a few minutes studying their design I am inspired to sit down and sketch out my next design. It was a different experience when my subscription to popular woodworking came in the mail. I was immediately drawn to the design article titled Improvisation. I thought this would be an interesting article. I thought the author would talk about improvisation much like a Jazz musician would. You know, making it up on the fly, feeling the design, playing off of what the other musicians are doing, or in this case what the other boards in the piece of furniture are doing. I thought this would be the holy grail and unlock the secrets to designing furniture. however I don’t think the author understands what the meaning of the word improvisation means. The article proceeded to tell you how to mathematically modify a design by applying it to different ratios and changing its scale, clearly this is not “creating action without pre-planning, or playing of of the other pieces in a spontaneous manner.” By the end of the article I found the inside of my eyelids far more interesting than the article itself. However, it still had me thinking. I have attempted to use ratios in my design such as the famous golden ratio, or the silver ratio, but in the end my eye told me it didn’t look right. I always end up deviating from the ratio to get the look that appeals to my eye. In my latest design I didn’t use any ratio’s for the design, instead I had a concept in mind with a few hard guidelines. 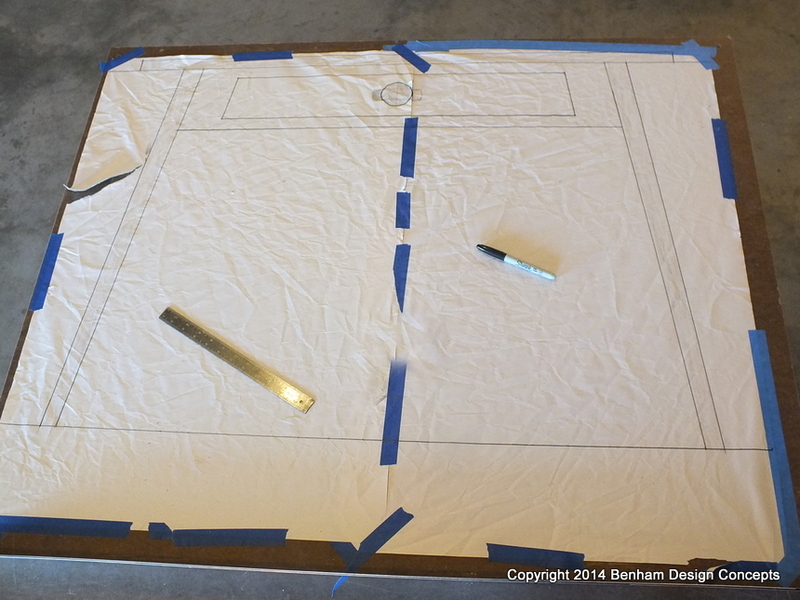 The table needed to be 40” wide and 30” tall. The legs needed to be angled, and it had to contain a drawer. I went out to the shop and drew a full size sketch of the table, and messed around with the angles of the legs until I found an angle that looked good to my eye. This method seemed far less complicated and I felt more like an artist or designer than a mathematician. All be it, this is a simple design but I think the more complicated the design the better this process work. Just think of all the math and ratio’s to figure out on a more complicated design, if you went that direction. I have read similar articles on design ratio’s over the years but I never follow the rules, and this leave me wondering if other woodworkers design by eye or calculation. I tent to start with calculations, the I go off the rails by eye. In the end, I’m usually satisfied with my results. I go by eye because i think thats the only way i can make something creative even if it is by mistake.